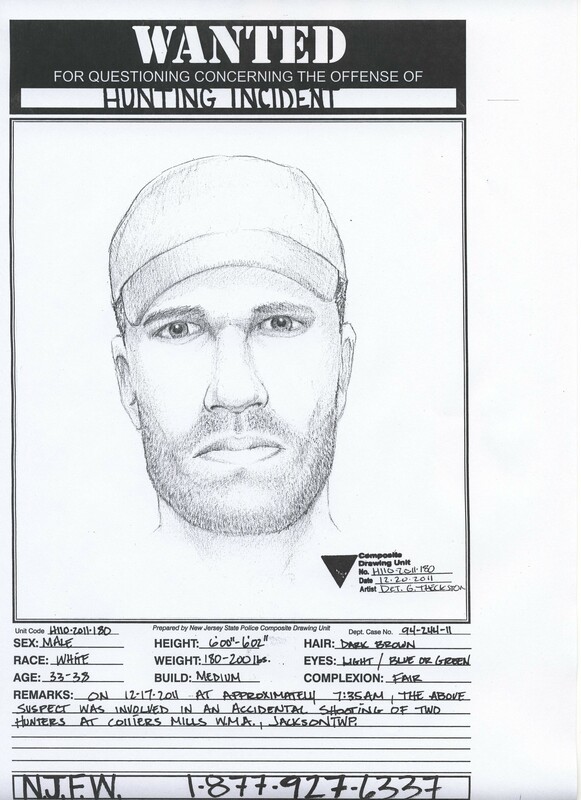 (11/P145) TRENTON - Authorities today released a composite drawing of a man believed to be responsible for shooting a father and son, and then leaving the scene, in a hunting incident on Dec. 17 in the Colliers Mill Wildlife Management Area in Jackson Township. The alleged shooter, who is being sought for questioning, is described as a white male in his mid-30s, with a medium build, about six-feet tall, 180 to 200 pounds, with dark brown hair and light blue or green eyes, according to Mark Chicketano, Acting Chief of the Division of Fish and Wildlife's Bureau of Law Enforcement. The incident occurred at 7:25 a.m. on Dec. 17 during pheasant hunting in neck-to-shoulder high grass at Colliers Mill. The shooter took aim at a pheasant that emerged from the grass, firing a volley of pellets at the bird. But the pellets struck the father and son hunters who stood only about 20 yards from the shooter. The father, age 60, from Manchester, was struck four times in the face. The son, age 34, from Jackson, was struck by five pellets--one in the forehead, two in the cheeks of the face and two in the hand. All of the pellets penetrated the skin. The two victims were treated for their wounds at the scene by emergency medical personnel and received subsequent care at Community Medical Center in Toms River. Anyone with information on this incident, or with knowledge of the alleged shooter, is asked to call 877 927-6337.